Go here and get your questions....it's fun! 1. On a scale of 1-10, how superstitious are you, honestly? Kind of, but not really. When Coach had a paying coaching job, we would wear the same Friday outfit until we lost and then change it up. It was a fun game while it lasted. 2. Julius Caesar is quoted as saying, "I came, I saw, I conquered." Which circumstance or experience of yours does this saying best describe? The laundry. Who wears all that stuff anyway? 3. 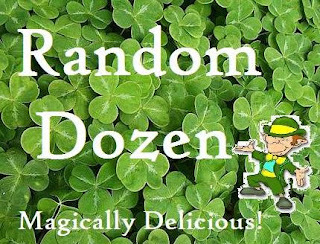 If I peeked in on your day like a mischievous little leprechaun, at what time would I most likely find you blogging? Evening and sometimes, early morning. 4. Re springing forward for Daylight Saving Time, is there anything you've ever been really early or really late for? I was 2 hours early for my hair appointment last month. I was 4 days late for my hair appointment in December. 5. What are you most looking forward to concerning Spring? Green grass. Flowers blooming. Sunshine. Extra recess. Riding my bike. 6. Shamrocks are the national flower of Ireland and are picked on St. Patrick's Day and worn on the lapel or shoulder. Do you wear green on St. Patty's Day? Since it's spring break, probably not. If I was going to be at school, yes. 7. One of Caesar's assassins, Casca, said, "But, for my own part, it was Greek to me," which of course means he didn't understand something. Probably his own lines in the play. Anyway, what is something that is "Greek to you," something incomprehensible or indecipherable? Hurting children is completely incomprehensible to me. 8. Is March behaving more like a lion or a lamb where you live? March is behaving like a ticked off lamb. It has yet to hit 70 degrees here and usually by now we have had several 70 degree days. Today, for instance, there is no sunshine and it is 40 degrees. The north wind is blowing. It is supposed to snow 6-8 inches here on Friday. REALLY? 9. "An extra yawn one morning in the springtime, an extra snooze one night in the autumn is all that we ask in return for dazzling gifts. We borrow an hour one night in April; we pay it back with golden interest five months later." -Winston Churchill. If you had one extra hour per day every day, what would you do with it? Read. Read. And more read. 10. Legend says that every Leprechaun has a pot of gold hidden deep in the Irish countryside. Aside from real gold or money, what material item would be in your dream pot of gold? At first, I wanted to answer a pool, but upon further consideration, I think that a sprawling country home next to a pool would more than cover it. 11. "The best things are nearest: breath in your nostrils, light in your eyes, flowers at your feet, duties at your hand, the path of God just before you." Robert Louis Stevenson. Look around you right now and tell us about something essential or beautiful very near you that you take for granted every day. I think this sums it all up.....the laughter of children. Duvessa O'Doherty. Wow. Pretty sure that is the name of a nun, just sayin'. Totally agree with #11 and I like #10. Dream big! I'm with you on the laundry: how can one teenager wear so many clothes? Every time I go into get my hair cut, I always ask if it's the right day/time! I don't know what part of the country you're in, but it's usually been 70 at least a couple of times by this date. Where is the global warming?